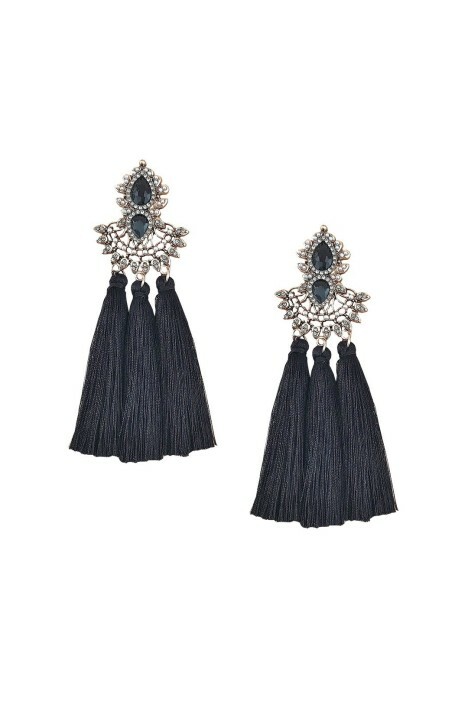 Tribal styling gets a luxe fix in this boho-chic tassel drop earrings. Featuring a statement Indian henna-inspired diamante and pearl combo in a rose gold colour. A perfect substitute to your everyday drop hoop, it’s a really great pairing for any slip on dress or rent a airy blouson sleeve mini. Give your hair a little volume and voila! You’ve got a play on textures with three silky tassels. A must have luxe statement piece, you can’t go amiss without one of these artisan teardrop fan designs. Why not grab a white clutch available to hire to compliment the pearls, before your head off to your next night concert or birthday dinner function. Read our blog on how to transform a day to night look!